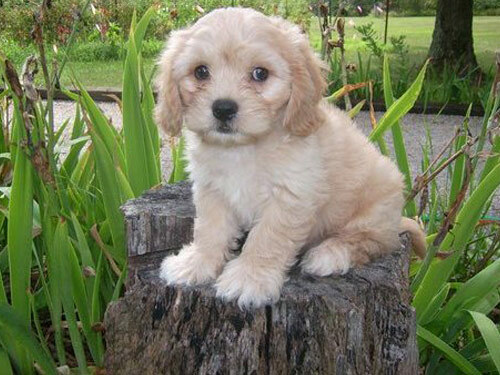 The Cavachon is created by crossing two breeds: Cavalier King Charles Spaniel and Bichon Frise. They are typically referred to as "designer dogs". They have become popular companions, especially to allergy sufferers. Small to medium in sie, the Cavachon possesses large expressive eyes and a sporty appearance. They are alert, sturdy, animated, and lively. The Cavachon is affectionate, loving, and gentle. They are very family oriented and do not do well if ignored or left alone for extended periods of time. They do best with older, considerate children or with children they have been with from puppyhood. Cavachon's will generally get along with dogs, cats, and other household pets. The Cavachon is non-aggressive but will alert their family to visitors and out of the ordinary sounds. Depending on coat type, the Cavachon requires regular brushing or professional clipping. It is important to regularly check and clean the ears. Dental hygiene is important to prevent early tooth loss. Cavachon's may be prone to such health issues as ear infections, skin problems, sensitivity to flea bites, heart problems, and hip dysplasia. The coat of the Cavachon may be silky and slightly wavy or loosely curled. Early socialization and obedience are recommended. The Cavachon may be difficult to housetrain. The crate method is recommended. Training must be done with firmness, fairness, patience, and consistency. The Cavachon is relatively active indoors. They are well suited for apartment living. They enjoy family activities, securely leashed walks, and off-lead play time in a securely fenced yard.